The magnificent Trebenishte krater has gone on display in Rome after receiving expert restoration in Italy. This is part of an exhibition on works of art from the National Museum in Belgrade. This draws attention to a second Trebenishte style krater that has been on loan to the Museum of Fine Arts in Houston. What is its collecting history? Where was it found? Why have the curatorial staff at MFAH been reluctant to answer questions? 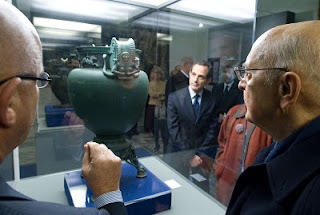 And what has happened to Conrad Stibbe's study of this second krater?